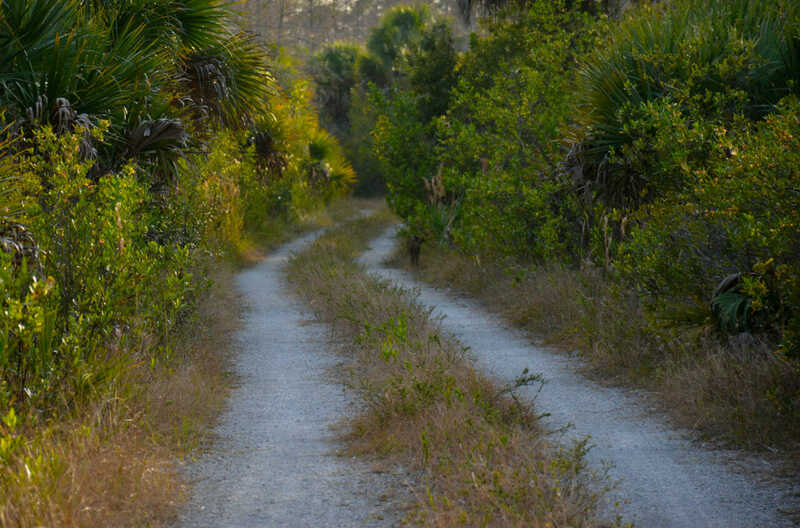 Florida Trail, I-75 to Seminole Reservation | Florida Hikes! 8.0 miles. 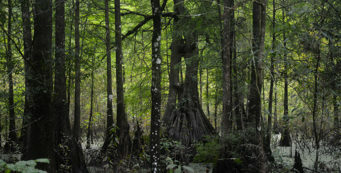 An easy ramble from the I-75 MM 63 rest area north along Nobles Grade to the gate at the Big Cypress Seminole Reservation, a limestone road raised up above the surrounding swamp, this segment of the Florida Trail parallels a canal much of the way through cypress strands and pine flatwoods. 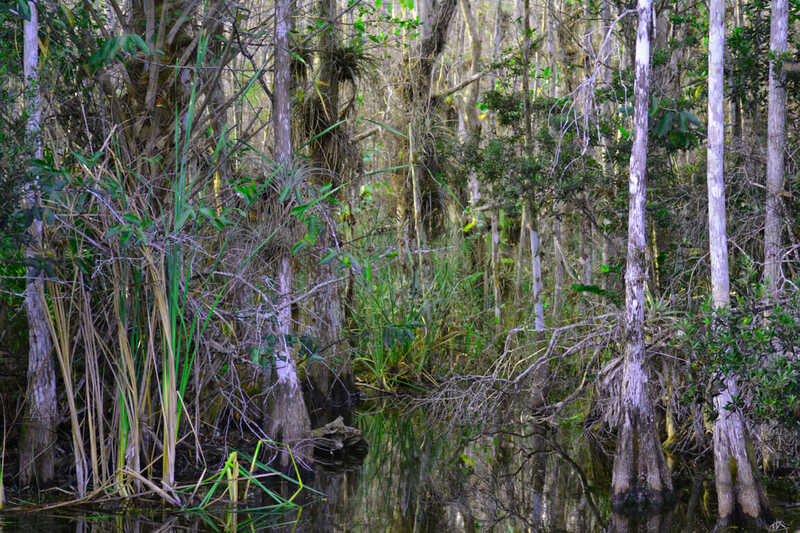 Unlike the vast watery wilderness to the south, the northern portion of Big Cypress National Preserve has been impacted by human presence. First, there’s Nobles Grade, which the Florida Trail follows northward. Hunters, fire crews, oil exploration crews, and ATVs have been spotted along this road, which sits just high enough out of the swamp that it doesn’t flood. However, that doesn’t mean you’re not in a wild place. Hikers have spotted Florida panthers and Florida black bears while walking up Nobles Grade. The canal adjoining the road – which is where the road fill came from – is home to alligators of enormous size, and it’s not uncommon for them to lie right next to the trail. Keep well away from them, at least 20 feet if possible. As in Big Cypress South, camping options are limited. There is one small tropical hammock that, if FWC doesn’t have equipment stored there, you can set up a tent in there. It’s at the end of the first obvious turnoff to the right north of the I-75 gate. The only other campsite on trail is Nobles Camp, 4.8 miles up Nobles Grade. 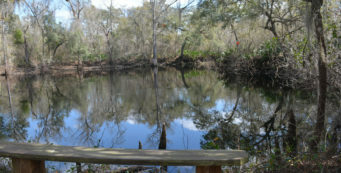 It has a picnic table and a small pond, although there is usually an alligator in the pond, making it a less-than-preferable spot to filter water. 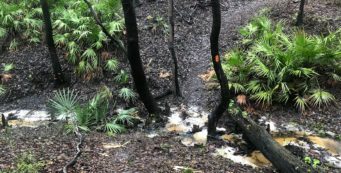 If you plan to continue north into the Big Cypress Seminole Reservation, you must complete a hold harmless form with the Seminole Tribe of Florida, and submit it to them in advance according to their directions. You can download and print off a copy here. 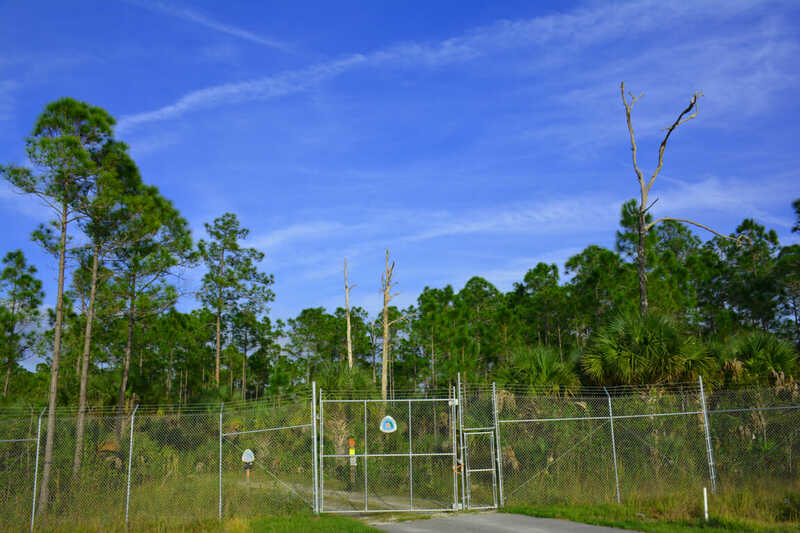 The northern portion of the Florida Trail in Big Cypress National Preserve is accessed through a gate from the north parking area at the Interstate 75 rest area at MM 63. 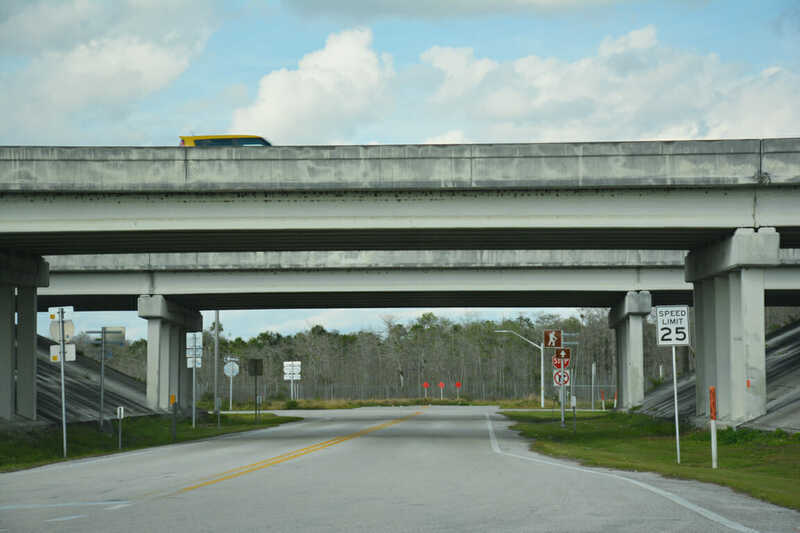 The rest area is between Fort Lauderdale and Naples, 13 miles west of exit 49 (Snake Rd) and 18 miles east of exit 80, SR 29. 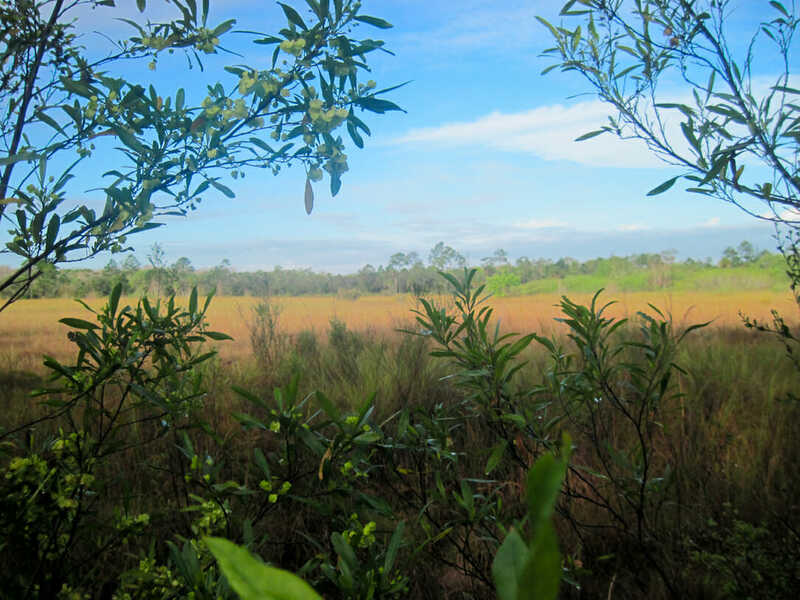 Gators to the left, cypress savannas to the right: that’s largely what you’ll encounter along Nobles Grade walking northbound from I-75. There are four side trails off to the east. 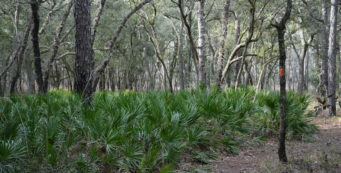 The first, just north of the gate and unmarked, leads to the tropical hammock where FWC often stores equipment. 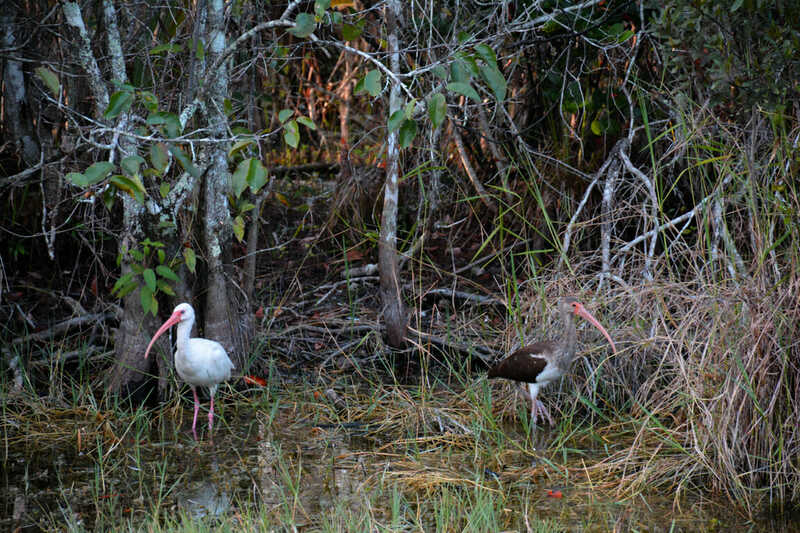 The next three are blazed and are part of the Big Cypress North Loop. 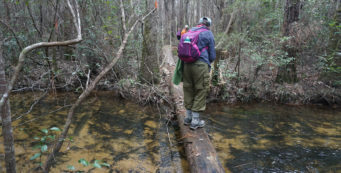 This loop extends northeast, enabling hikers to make use of several campsites – CCC, Panther, and Carpenter – while sampling a smaller cross-section of soggy Big Cypress habitats. 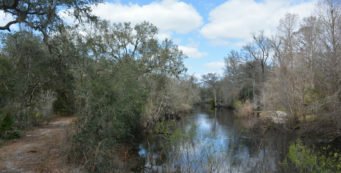 After passing Nobles Camp, site of a former airstrip, there is a major trail junction where you need to decide whether you are heading into the Big Cypress Seminole Reservation (permit required in advance) or are looping back around to your starting point at the I-75 North Rest Area parking area through the loop system. Using the 8.2 mile trail to the east, you can hike up to 14.6 miles in a loop, starting and ending from the I-75 rest area. If you’re headed northbound to the Big Cypress Seminole Reservation from this junction, the walk along the forest road is mostly dry, but the habitats surrounding you are wet. Despite the pine flatwoods, be alert for alligators in this section up to the reservation gate as well. This mileage includes the 0.6 mile walk between the south gate and the north gate through the rest area. Departing directly from the north gate, it’s 7.4 miles to the Big Cypress Seminole Reservation.